Coloring pages that are free to print. Western, rodeo, horse, cowboy, cowgirl and other coloring page themes. Free printable activity pages. Rodeo Bingo and western word games. Free printables for party. 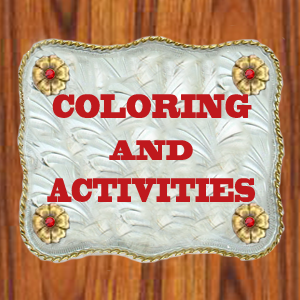 I have created several pages of original western and rodeo themed coloring pages and activities. The coloring pages were made from many of my family photos of our rodeo, trail ride and other western activities. Here is an example of how I turned a picture of my niece at the rodeo into a coloring page. My collection of coloring pages also includes many free public domain coloring pages that I have added as additional resources for you. There are a few pages with other themes also. Please enjoy and feel free to download and print all you want. Horses and more horses. Coloring pages with a variety of different horses. Witches, ghost, pumpkins, haunted houses and other Halloween themed pictures. Santa's Ranch, Cowboy Santa, Cowboy snowman, horses and others. Santa pictures, ornaments, sleigh, wreath, stockings and other winter and holiday themes. Wedding Coloring Pages featuring western wedding themed pages. Color pictures of everyones favorite party cup. numbers for a rodeo party and more. Printables are a good way to save some money on party decorations, crafts and activities or classroom decorations. Stop by for some free printables.